Android phones using Snapdragon 845 will ship next year, Qualcomm said. On Wednesday, Qualcomm revealed its first concrete details of the Snapdragon 845, the next-generation mobile chip that stands a good chance of being in your next smartphone. The 845 will ship in early 2018, and appear in phones sometime after that. Qualcomm calls the Snapdragon 845 a chip to improve both artificial intelligence and immersion, blending the future of smart devices with the past. At its heart lies the Kryo 385, the semi-custom, upgraded CPU. It’s still an eight-core device, with four performance cores running at 2.8GHz and four energy-efficient cores running at 1.8GHz. That represents a 25- to 30-percent improvement over the existing Snapdragon 835 in the performance cores, and a 15-percent improvement in the smaller, energy-efficient cores. While speeds and feeds may not be as important in the mobile space, the Kryo core inside the Snapdragon 845 still matters. Phones that use the new Snapdragon 845 will be able to loop more than 20 hours of continuous HD video before expiring, executives said. Those phones will also be able to capture four hours of continuous video playback, or play VR games for over three hours. 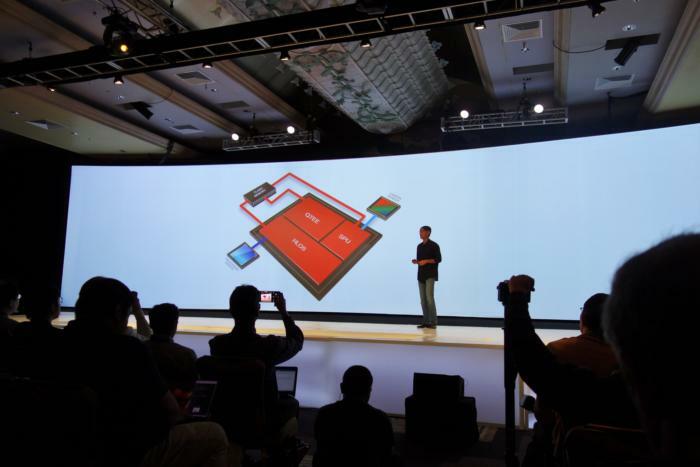 Talk time, using what Qualcomm calls Ultra HD Voice, will last over two days, the company said. Qualcomm believes in “heterogenous” computing, a fancy name for designing specific parts of the chip for specific tasks. 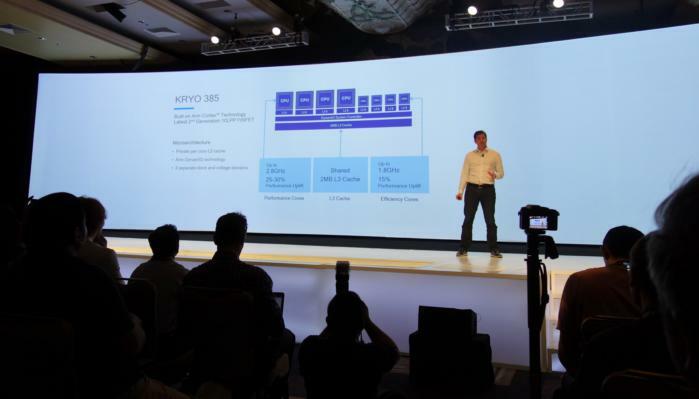 With the Snapdragon 845, Qualcomm has focused on five different areas: “immersion,” AI, security, connectivity, and performance. Immersion is seamlessly capturing the world around you, said Tim Leland, vice president of product management for Qualcomm. The 845 improves in two different areas: capturing the world around you, and improving on those experiences. The key to Qualcomm-powered cameras is the Spectre 280, the image signal processor that’s designed to deliver best-in class image quality even when there’s a lot of movement or not a lot of light. Previous Snapdragons—the Snapdragon 820, for example—focused on 4K playback at 60 frames per second. The key feature for the Snapdragon 845 is to capture Ultra HD Premium content at 60 fps—that’s the 4K standard that includes 10-bit color depths as well as Rec. 2020 color space representation. According to Leland, your smartphone videos will look more lifelike than ever before. Camera powered by the Qualcomm Snapdragon chips have steadily improved. With the Snapdragon 845, Qualcomm is supporting higher-quality images. Qualcomm also believes that 845-powered smartphones can break the 100 mark in DXomark, generally considered the standard for image quality in smartphones. Color volume will increase, including color depths, which will help reduce banding in skies and other backgrounds. The Spectre 280 will improve the color gamut—the range of colors that the image signal processor can support. The Snapdragon 845 will be able to encode to the Rec. 2020 color gamut, offering significantly higher color quality than the existing Rec. 720 color gamut. The Spectre 280 will also support the Rec. 2020 range in luminance, improving the quality of HDR shots. “We think consumers will be amazed at just how high the quality of video is with the Snapdragon 845,” Leland said. One of its coolest features is a twist on computational photography—what Qualcomm calls a “real-time cinemagraph.” With this feature, you’ll be able to record a scene as video, then composite it over the same scene, recorded as a photo. The end result will be that part of a scene will be recorded as a video, such as a fish swimming in a fishtank. The remainder of the scene will appear as a photo. It’s an effect you’ll need to see to believe. Other features that the Spectre 280 core will support include image compositing and slo-mo video at 720p HDR10, and at 480 fps. Motion-compensation temporal filtering and accelerated image stabilization will use video from adjacent video frames to improve the quality. The Spectre 280 will also include features designed for machine vision, such as depth sensing. Computer vision will be used to apply bokeh filters, as well as to analyze faces. The Qualcomm Snapdragon 845 also includes mixed-reality or XR capabilities. XR is Qualcomm’s umbrella term for the combination of augmented and virtual reality. XR has been improving every generation, Leland said. For example, the Snapdragon 835 introduced six degrees of freedom, as well as 1.5K x 1.5K at 60-fps resolution. With the 845, Qualcomm is adding room-scale, six-degrees-of-freedom SLAM (simultaneous localization and mapping). Snapdragon 845-powered devices will track your hands, too, working with accessory makers to make sure their products are tuned for the Snapdragon 845 chip. 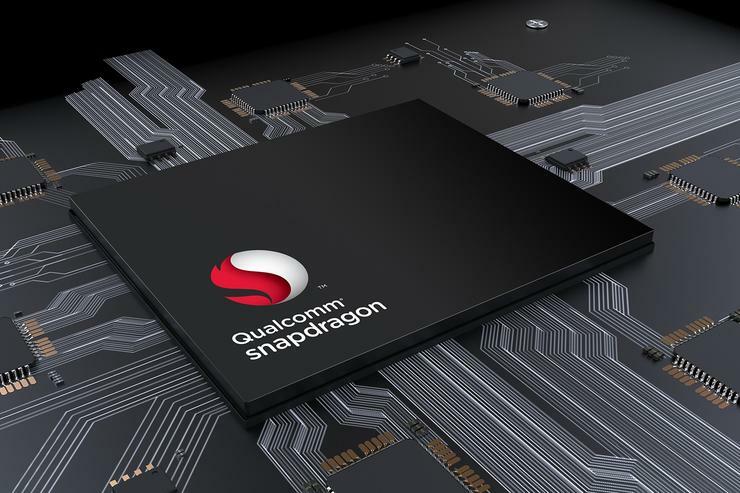 Another key part of the Snapdragon 845 is the Adreno 630 graphics core, used for gaming and applications like XR. The Adreno 630 will boast 30 percent faster graphics, and 30 percent better battery efficiency, Leland said. The Adreno 630 will also be smarter, using features like foveated rendering to detect what you’re looking at, applying the highest-resolution details to where your attention is focused. Otherwise, it dials down the detail. Multiview rendering, another new feature, plays into this: A scene is rendered once for one eye, then automatically offset for the other eye. 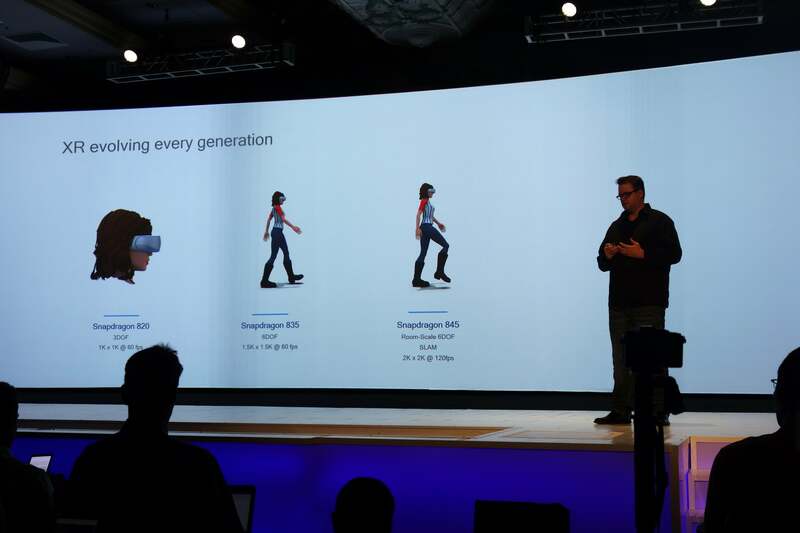 The Snapdragon 845 was designed to address a shift in AI, according to Gary Brodman, director of product management at Qualcomm. Consumers aren’t willing to wait for data to be transferred to the cloud, acted upon, then sent back down to the device. Instead, they want the smarts right within the device itself. Qualcomm calls the 845 its third-generation mobile AI platform. Additions such as core optimizations make on-device machine learning more efficient and powerful, Brodman explained, such as working with other cores on the device to help them recognize objects. In general, the 845 is 10 percent more energy-efficient and offers 10 percent more performance, Broadman said. Neural-network performance has improved by a factor of three times over the Snapdragon 835. Brodman outlined a few ways AI will benefit consumers: applying visual themes (think Van Gogh’s Starry Night) to video as it’s being shot, for instance, or a using a “deep portrait” feature to apply bokeh with just a single camera lens. And, of course, there’s Face ID, a way to unlock your phone when it recognizes you. With the Snapdragon 845, Qualcomm built what it calls a “secure vault” right in the heart of the platform, according to Sy Choudhury, the senior director of produict management for Qualcomm. Trusted computing environments are being hacked, and state-sponsored agencies are in play. “Even though we felt we had a high level of security, we felt we needed to raise the bar,” Choudhury said. Some of the detail Qualcomm offered on its new security vault. Naturally, it wasn’t willing to reveal too many details to educate the bad guys. The Secure Processing Unit is its own separate, isolated core, with its own CPU, crypto engine, memory, its own random number generator and even its own power supply. Within the Snapdragon 845, all of the authentication takes place within the Secure Processing Unit, and all of the biometric information is stored there. “The reality is that when you’re saving your files, those files are encrypted with a digital key—within Android Oreo and Windows 10, each file is encrypted with a unique key. That’s really good security,” Choudhury said. With this new security model, what were previously discrete components on a board can now be integrated within the processor, Choudhury said. 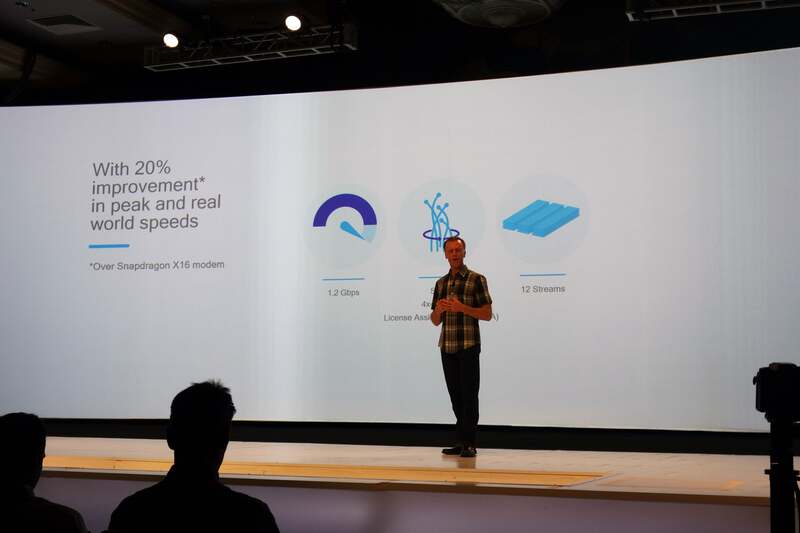 Qualcomm’s wireless business is eager to push the world toward 5G connectivity, and the new Snapdragon X20 modem is the company’s second gigabit modem. It’s 20 percent faster on average than the previous X16 modem, with 1.2Gbps sustained speeds. It's aided by 5X carrier aggregation, receiving up to 5 separate radio channels on your device with four separate antennas (4x4 MIMO). Increased connectivity is a key part of the Snapdragon 845 and the new X20 modem. The 845 includes multi-gigabit Wi-Fi, with 802.11ad baseband that can switch among separate modules within a phone to give you better reception. The 845 also boasts a set of Wi-Fi protocol enhancements—fast initial setup—that will improve the Wi-Fi setup time by 16 times, adding 30 percent more effective capacity. All that means, Carson said, is that you’ll be able to go to a conference or an airport and have a better chance of connecting to congested Wi-Fi networks than before. Advanced Bluetooth TrueWireless is Qualcomm’s name for broadcasting HD-quality music to several headsets—allowing you to share music from a single phone to several nearby friends. Bluetooth TrueWireless uses Bluetooth headsets as a mesh network of sorts, routing audio from headset to headset. The upshot? Up to 50 percent battery savings compared to the Snapdragon 835, Carson said. “It’s a big step toward the 5G experience,” Carson said. 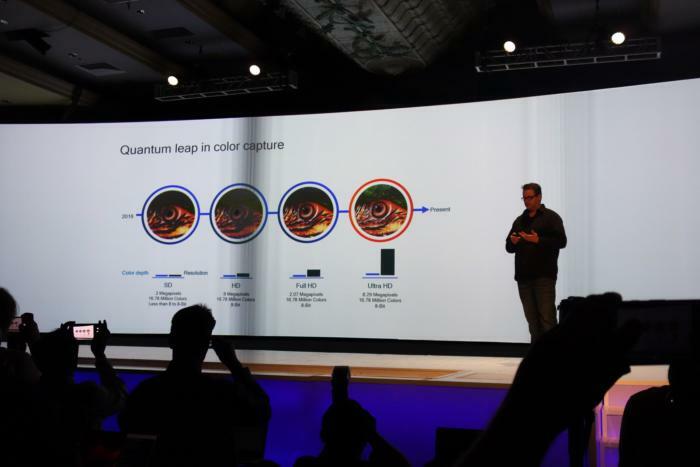 With the Snapdragon 845, Qualcomm is offering more than 20 hours of continuous video playback, or capture of over four hours of continuous HD video. VR gameplay will be possible for over three hours of continuous gameplay. With Ultra HD Voice, you’ll be able to talk for more than two days continuously, Carson said. The 845 also supports QuickCharge 4, which will charge your devices from 0 to 50 percent in 15 minutes. It’s already supported by 160 devices, Carson said, and is a superset of the related USB-PD charging standard. According to Lanier, battery life improvements are made possible by heterogeneous computing—a fancy name for parts of the chip that are optimized for specific tasks. One challenge is artificial intelligence, where the whole chip is involved. Fetching data can cost power, so Qualcomm added a 3MB cache to improve performance. Qualcomm believes the Snapdragon 845 is ready for a multitude of different applications, keeping you connected while your phone helps you take sophisticated video and plan your next lunch meeting. Qualcomm’s Snapdragon 845 chip is scheduled to appear in high-end phones beginning in 2018.